Market-moving comments from Trump have led to big swings in currency, financials, and steel stocks. Donald Trump's not shy when it comes to sharing his opinion, and his straight-to-the-point approach has caused investors to whipsaw in and out of sectors, industries, and stocks since his election last November. Most recently, his comments about the dollar, and uncertainty regarding trade-deals and infrastructure plans, have taken a big toll on the U.S. dollar; banks; and steel, copper, and iron ore stocks. Anders Bylund (dollar exchange policy): U.S. presidents tend to avoid talking about the dollar's exchange rates, and they very rarely take a direct hand in setting international policy for this key financial data point. If forced to post direct commentary on the direction of the dollar, most Oval Office residents have preferred to stick with the mantra that a strong dollar equals a strong economy. Donald Trump broke rank with these traditions last week, and his words immediately pushed dollar values lower. In an interview with The Wall Street Journal, Trump said, "our dollar is getting too strong, and partially that's my fault because people have confidence in me. But that's hurting -- that will hurt ultimately." Looking past Trump's tendency to pat his own back for a global economic trend that started way back in 2014, it's true that a strong dollar can limit American export sales. Rising exchange rates can also push down oil prices in the long run, make gold a less-attractive value preserver, and change the game for many other investable markets. We'll see how long Trump will stick to his stated preference for a weaker dollar. Chances are, he'll change his tune again when his advisors get around to explaining how the currency trade actually works. It's a balancing game where every action comes with an equal and opposite reaction, and the American economy you see today was built on the tenets of lifting and protecting the dollar's international standing. Tough export markets are paired with cheap imports, and a strong currency ultimately rests on the solid ground of economic fundamentals. Among the true drivers of long-term currency power, you'll find low unemployment and high productivity levels. Would Trump really prefer cutting American jobs in exchange for better-looking export statistics? 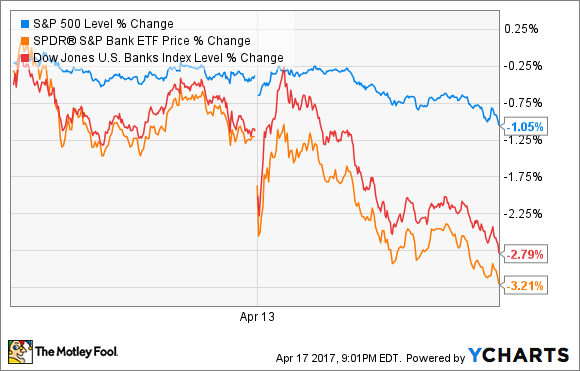 Jason Hall (bank stocks): Trump's recent claim that the dollar was "too strong" didn't just affect the U.S. dollar; his comments also had a big, market-moving effect on bank stocks. Bank stocks have been on a tear since Trump's election, driven up by predictions that republicans would begin easing regulations and lowering corporate tax rates, which would boost bank profits. Factor in expectations that interest rates are likely to steadily -- if slowly -- increase in the coming years, and that's a third reason investors have flocked to bank stocks since last November, which have generated nearly double the returns as a category than the S&P 500 since the election. Many investors who expect rates to steadily increase got spooked by Trump's words. The sad irony is, many bank stocks have regained the short-term losses following Trump's comments. This is at least in part because, despite having the biggest bully pulpit from which to speak, the president has -- and many investors likely figured this out after the fact -- little direct control over a lot of economic policy. Federal Reserve Chair Janet Yellen's term doesn't expire until January 2018, and even though Trump could remove her as chair, she would remain on the board, and her fellow board members are generally committed to the same slow, steady rate hike policy Yellen has supported. Todd Campbell (steel, copper, and iron ore): When it comes to the recent nosedive in steel, copper, and iron ore stocks, it's more about what Trump hasn't said than what he has said. Trump is a vocal supporter of a massive infrastructure spending program, but there's mounting fear that he won't be able to get such a program passed in Congress. The hope of a spike in U.S. infrastructure spending and tariffs on foreign steel caused steel, copper, and iron ore stocks with U.S. market exposure to soar after the election. Some stocks, such as Cliffs Natural Resources (NYSE:CLF) -- a major provider of iron ore pellets to U.S. steel producers -- more than doubled. However, following Trump's failure to win an Obamacare repeal-and-replace vote shows how tricky it is to get policy across the legislative finish line, and that's causing investors to walk back their optimism in these stocks. Investors are now left wondering what his strategy will be on infrastructure. Will he embrace tax reform or infrastructure first? Will he merge the two policies into one bill to strong-arm support? We simply don't know what his current thinking is on infrastructure. Adding more worry is Trump's shifting rhetoric toward China. China is notorious for dumping steel (via South Korea) on U.S. markets, but Trump has been saying lately that he'll be easier on China on trade if it helps keep North Korea in check. If so, his softening on trade raises additional questions for steel, copper, and iron ore investors. Overall, the steel, copper, and iron ore "trade" has become way more uncertain than it was in January, and that makes these stocks incredibly risky. Having said that, these stocks have given back a lot of their gains, and after their drop, they may be under-pricing potential growth from ongoing U.S. economic expansion. Also, there's still a very real chance of an infrastructure bill passing at some point, and if it does, these stocks could head higher again.